Hello! It's Feature Day at Your Next Stamp and the theme is Winter Warm Up! 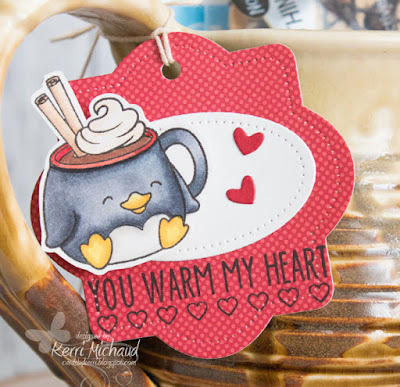 I decided to make a little tag using the new Cool Tag Five Die Set along with this adorable image from the Sweet Holiday Greetings Stamp Set and a sentiment from the Hot Cocoa Phoebe Stamp Set. So cute! The little hearts are some leftovers from using the Heart Border Die which is on clearance! Head over to the Your Next Stamp Blog to see the rest of the DT projects and leave a comment for your chance to win a Stamp Set of Your Choice!!! Comment must be left by February 24th at midnight EST and the winner will be announced February 26th.